Apple Howgate Wonder produces very large dark red apples in October. This dual purpose apple is from the Isle of Wight in 1915 and has a light flavour. The fruit is sweet and juicy and picked from the tree makes a tasty eater. 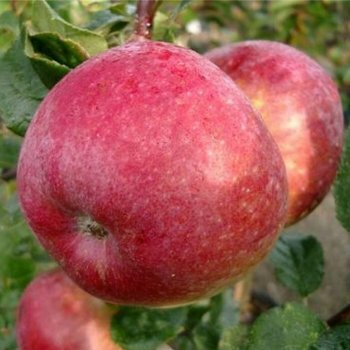 Ideal for northern areas and less favourable spots Apple Howgate Wonder is a great all rounder. As a group B Apple, Howgate Wonder requires a pollination partner in group A, B or C to be situated within a half mile radius. *Indication of the un-pruned height of this variety of apple tree on different rootstocks in 10 years. Variations will occur due to geography, pruning etc. Howgate Wonder is a dual purpose apple in pollination group B that requires a suitable pollinator within a 1/2 mile radius. Apple trees should be spaced according to their rootstock, for example an MM106 (semi-vigorous) rootstock will require approx. 4.5 metres between trees, whereas an M27 (very dwarf) rootstock will require approx. 1.5 metres between trees. Our pot grown apple trees can be planted at any time of the year but bare root ones need to be planted between November and March. Remove weeds and grass within a metre of your desired planting hole then dig a hole slightly deeper than your root mass and approximately 3x as wide. To help your tree establish more effectively, apply root grow. Gently loosen the roots and place into the planting hole. Using 50% of the original soil and 50% compost, fill in the hole and firm around gently. Make sure not to bank the soil up around the collar of the tree. We recommend planting fruit trees using a stake and tie and a rabbit guard. The Apple Tree Planting, Pruning & Care guide has more detailed information on planting apple trees, as well as videos on planting trees and using stakes and ties. If you’re planting in spring or summer, water well and regularly for the first few months. If you’re planting in autumn, you may only need to water your tree a little. It is important to keep an eye on young fruit trees and increase watering if there are extended periods of hot or dry weather. Keep the area free of competing weeds and grass for the first couple of growing seasons. The Apple Tree guide linked to above provides further advice. Pruning young apple trees for the first few years after planting ensures a healthy, goblet-like shape. Your tree should have one central leader and several side shoots. Straight after planting, you can remove the lowest laterals. In the following years, remove any shoots growing out of the trunk to maintain a clear stem. Also remove any crossing, diseased or damaged branches. If your tree is looking overcrowded, remove some of the larger branches to open up the canopy. This type of pruning should be carried out between November and March. The Apple Tree guide linked to above provides detailed pruning advice. 4-5 metres (13-16 feet) in 10 years - ideal for smaller orchards, individual specimen trees and espalier training. Our most popular rootstock for all but the very small garden. 2.5-3 metres (8-9 feet) in 10 years - Ideal for smaller gardens as specimen trees and suited to cordon training. 2-2.5 metres (6-8 feet) in 10 years - Perfect for tight spots and patio growing in containers, also well suited to training as a cordon. 2 metres (6 feet) in 10 years - The smallest of the dwarf apple trees, M27 is ideal for growing in a pot and the smallest of gardens.